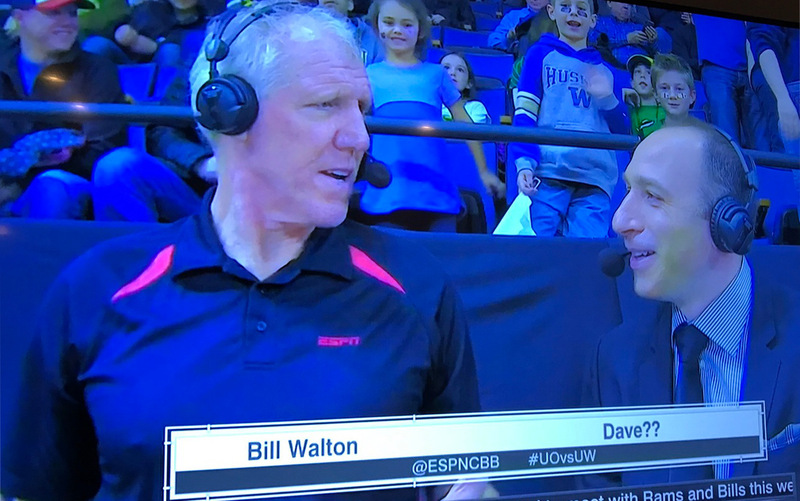 When @DavePasch has no idea what @BillWalton is talking about but is nice enough to let him finish his story on "Cape Flattery"
Ahahaha @DavePasch your ESPN team is killing it. "Dave??" on that lower third. Amazingly, if you look at the time stamps there, it appears that this went on for the whole game; tweets about it start at 6:07 p.m. Pacific, and then there’s a flood more at 7:48. However, this seems like an understandable error. Perhaps the graphic was done up before it was confirmed that Pasch would be on this game, and it’s notable that he’s been calling some college football bowls lately (including the Rose Bowl on ESPN Radio Jan. 2), leading to Walton doing hoops with other analysts. It seems quite probable someone did this up at first with the idea to change it later, and then just never got around to doing it. It is curious that no one noticed and changed it even after it aired, though. Did they at least give a “I’m sorry, Dave, I’m afraid I can’t do that” response? In any case, they gave Twitter some good material. They also managed to make “Dave? ?” the more-talked-about part of his pairing with Walton, which is something we almost never see. Update: Pasch was not in on the gag. @jklockz @awfulannouncing I wasn't in on it. I actually just found out about the graphic when I read the article.